Most of us take transportation for granted. America on the Move - by means of its exhibition in Washington (the largest at the Smithsonian's National Museum of American History), its education kits circulated to school districts throughout the U.S., and its extensive website - counters that attitude. Society has always depended on its systems of transport. The timeline of America on the Move begins in 1876, the nation's Centennial. By that time, railroads had already spanned the continent and united the country in an unprecedented transportation network. The results were soon profound: economically, culturally, and politically. Personal mobility radically expanded; one could travel across the country in a week in the 1870s instead of taking several months just a decade before. The economy began a huge expansion, growing almost ten-fold in the last quarter of the 19th Century. Physical mobility became essential for social mobility. And the old sectionalism of our pre-Civil War politics eroded. As historian John Hankey has noted, citizens spoke more often of a singular, "this United States" instead of a plural, "these United States." Railroads in the 20th century continued to develop. By 1970, rail freight began setting all-time yearly records. Between 1970 and 2000, rail freight doubled. There were, however, many big adjustments along the way. Locomotives and track-laying crews meet at Promontory Summit, Utah, on May 10, 1869, on the completion of the world's first transcontinental railroad. Whereas in 1900 the train carried almost all long-distance travelers, in 2000 such travelers almost all went by car or airplane. America on the Move highlights this complex history, with a preamble from the late 19th century. To the right is the famous photograph by Andrew J. Russell of the ceremony that celebrated the final joining of the rails of the world's first transcontinental rail line. On May 10, 1869, a golden spike was driven, a telegrapher signaled, "Done!" and bells rang in cities from coast to coast, in one of the first news bulletins shared nationwide in real-time. Santa Cruz, California, was typical of hundreds of small towns throughout the American Midwest, South, and Far West: citizens dreamed of a railroad connection, knowing full well that their town could not prosper economically without one. 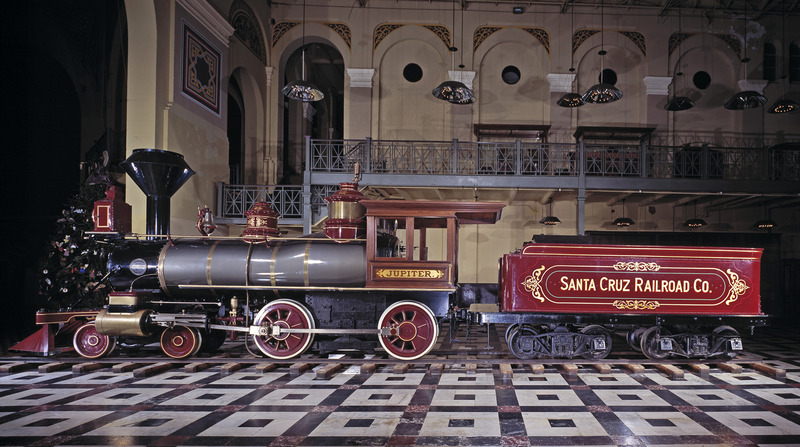 Santa Cruzans built their own railroad, since the biggest railroad in California at the time would not build the necessary spur line to the little coastal town. The Santa Cruz Railroad opened for business in 1876, and its locomotives “Neptune” and “Jupiter” pulled trains of passengers and freight the 13 miles between Santa Cruz and Watsonville - where there was a junction with the Southern Pacific Railroad and connections to all the rest of the nationwide rail network. Jupiter was the Santa Cruz Railroad’s third locomotive. Built for narrow-gauge track (36 inches between rails), Jupiter became obsolete in 1883 when the line switched to standard gauge (56 ½ inches). Jupiter was sold to a company in Guatemala, where it hauled bananas for more than 60 years. In 1976, it came to the Smithsonian as a part of the United States bicentennial exhibition. Santa Cruz and Watsonville both prospered - but in ways unexpected by the Santa Cruz Railroad’s managers and investors. Industry grew in Santa Cruz. By 1900, though, tourism was the thing, as more and more vacationers from San Francisco and elsewhere in central California enjoyed the town’s beaches and nearby redwoods. And between 1876 and 1900, Watsonville became part of an agricultural revolution that eventually spread throughout California’s coastal regions and vast central valley. The key for both towns was the rail network, which not only brought more industry and tourists to Santa Cruz, but allowed the agricultural produce of the surrounding area to reach new markets. What was grown and what was transported then changed in response. Watsonville growers (in the Pajaro Valley, a dozen miles inland from Santa Cruz) found that sugar beets grew well there. The expanding market for sugar led to the building of a big Spreckles Mill in Watsonville, which processed beets into raw sugar. This output was sent for refining to San Francisco — on the Southern Pacific Railroad, which had connected to Watsonville several years before the little Santa Cruz Railroad was born in 1876. 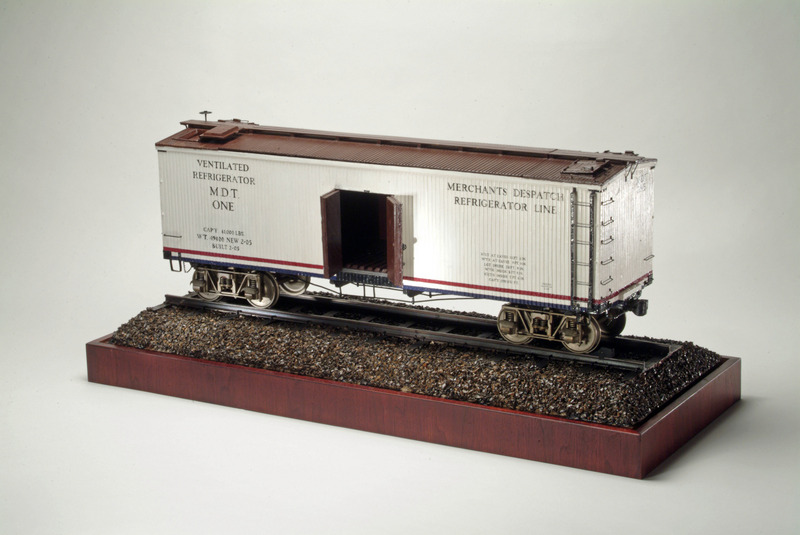 Large model of refrigerator car, with doors open Ice to cool the car's interior was loaded into bunkers at either end. (The small hatches at the roof corners opened into the ice bunkers.) Ice was cut from lakes in the high Sierra Mountains during winter and carried by rail to "ice houses" (icing stations on rail sidings) located in agricultural towns that shipped perishables. Packed in straw in a large room at each ice house, the ice lasted well into summer. By the 20th century, refrigerated ice plants produced ice locally in towns in the fruit-growing regions. As marketing opportunities were opened up by the rail network, various crops expanded: apple production grew rapidly, since apples could go safely by rail throughout the West and across the country. Then farmers changed successfully to perishables, such as strawberries. Railroad cars refrigerated with ice could carry strawberries as far as Chicago and, later, occasionally as far as New York and Washington, DC. Thus American diets changed. In Santa Cruz, industries that were there grew further: lumber, fishing, tanning, lime production. Tourism, too, began to grow, since people from San Francisco and the region could more easily enjoy Santa Cruz's beaches. Demographics, too, changed. In Santa Cruz and Watsonville, the same Chinese who had built many of the railroads in California shifted to agricultural work. Ultimately, California’s population of today was shaped by the agriculture and industry that grew there in the 20th century. Hence the population was shaped by the many immigrants pursuing economic opportunity — Japanese, Filipino, Latino, other European, African American — who followed Spanish, whites, Chinese, and others in pursuit of better lives. For the little Santa Cruz Railroad itself - as for many smaller railroads built in the late 19th century - its story was briefer. The line could not generate sufficient levels of passengers and freight to survive by itself. By the early 1880s the line was insolvent and it was sold to the much larger Southern Pacific. When the new owners converted the Santa Cruz-Watsonville line to standard gauge (the same gauge - width between the rails - as most of the rest of the nationwide rail network), the convenience of using the line was improved: passengers and freight no longer had to change cars at Watsonville. Elsewhere in California, however, many farmers objected to rising shipping charges, and controversy arose about the role of big railroads and other big industries in American life. But compared to earlier forms of transport by wagon road and canal before the Civil War, railroad transport was about ten times cheaper and ten times faster. In 1860, railroads carried 3.2 billion ton-miles of freight. By 1900, that figure was 141 billion ton-miles - a stunning 44-fold increase. Source: J. H. White, The American Railroad Freight Car, Table 1.2. 1860 figure from A. Fishlow, American Railroads and the Transformation of the Ante-Bellum Economy. 1870 figure: author White's estimate is 8.0-10.0 billion ton-miles. 1880: from U.S. Census. 1890 and 1900: from Poor's Manual of Railroads for years cited. Researching the life and times of a historic object reveals many engaging stories. A small, toy-like locomotive such as this one can lead you to stories about work, industry, or personal experience. The Olomana was purchased for the sugarcane industry that developed in the Kingdom of Hawaii in the 19th century. It served in the fields for 62 years pulling cars of sugarcane from the fields to the mill for processing. During this time few mechanical changes were made; however, the boiler was replaced twice and the fuel was changed from coal to oil in 1928. The Olomana was built in 1883 by Baldwin Locomotive Works of Philadelphia, Pennsylvania. Baldwin, a prosperous locomotive builder, shipped the little locomotive around Cape Horn to the Waimanolo Sugar Company in the Kingdom of Hawaii. The Olomana is a small industrial locomotive designed to be used for mining, logging, and on plantations. They burned wood, coal coke, or dry refuse such as dry sugarcane for fuel. Such locomotives were operated on a narrow-gauge track (gauge refers to the distance between rails) and used to pull or push loads of sugarcane for short distances. Although sugarcane had been grown in Hawaii since the early 1800s, the first export of sugar did not occur until 1837. Through the 1840s, sugar grew more important to the local economy as it became one of Hawaii’s chief exports. With the expansion of sugarcane fields came the need for more labor. Workers were brought into the islands under contract as cheap labor. Most came from Asia, notably China and Japan, and after 1900 the Philippines. Smaller numbers also came from Korea, Europe, and North America. The Olomana was purchased to get the sugarcane from the field to the mill. Working the plantation was a sunup to sundown job. Skilled and unskilled laborers were needed in the fields, the mill, the plantation store, and the clerk’s office. A worker’s life centered around the plantation. By sweat and tears we get by” is part of a Japanese bushi work song. New immigrants combined traditional folk tunes with lyrics describing their work life in the sugarcane fields. The seeds were planted and tended during the year. Water needed to be brought in from artesian wells. When the stalks reached about 12 feet, it was time to harvest. Both men and women labored in the fields. Men would cut the cane, and women stripped the dry sharp leaves from the stalks. The stalks were bundled and carried to waiting wagons or small railcars. To move the harvested crop to the mill, workers laid temporary track in the area where the sugarcane had been cut. Men bundled the stalks and loaded them high on small, four-wheel railroad cars in the field. After loading, one man would operate the locomotive, while others watched closely as the train moved along the temporary track. Maintaining traction was very important. Sand often was thrown on rails which were covered by juice from the sugarcane. The temporary track could be taken up and put down in another part of the field. Pau Hana: Plantation Life and Labor in Hawaii 1835-1920, Ronald Takaki. Honolulu: University of Hawaii Press, 1983. America On The Move illustrates the place of railroads in America’s mobility and commerce in the late 1920s, using the example of Salisbury, North Carolina. In the late 1920s, railroads carried almost 800 million travelers and commuters annually, which was about 70 percent of all intercity travel. From 1926 to 1930, railroads handled 75 percent of intercity commercial freight, amounting to an annual average of 427 billion ton-miles of cargo (lakes, rivers, and canals carried about 17 percent of intercity freight). Salisbury, North Carolina, in 1927 - like all cities and towns in the country - was dependent on railroad transportation for most of its economy. A conductor (middle left) and porter (second from right) assist travelers boarding a passenger train. Postal Department clerks sort mail aboard a Railway Post Office (RPO) car, literally a U.S. post office on wheels. The Salisbury section of America On The Move shows travelers, freight handlers, and railroad workers - all involved in the life of the community. The centerpiece is the Smithsonian’s famous locomotive No. 1401, built in 1926 in Richmond, Virginia, and which from that year until 1952 pulled the Southern Railway’s most important passenger trains between Greenville, South Carolina and Salisbury. Surrounding the 92-foot long 1401 are a number of exhibit treatments. First is a passenger-depot waiting room modeled after the depot that still stands in Salisbury. Then comes an exhibit treatment about the conductor and porters on a passenger train of the era. In the Salisbury Depot waiting room, a large, detailed model of a passenger train - with cutaways to show the interiors of a mail car, coach, dining car, and Pullman sleeping car - orients modern museum visitors to the architecture and internal arrangements of a steam-era passenger train. Part of the exhibit describes the rail-borne economy of Salisbury. Other parts tell about the locomotive crew and about some of the many railroaders who worked behind the scenes - clerks, track crews, dispatchers, tower operators, agents - to maintain and run a railroad. At either end of the waiting room, two travelers tell their very different stories and relate the indispensable role of transportation in their lives. One is a salesman from Salisbury Mills, one of 15 cotton mills in and around the city in the mid-1920s. He is on his way north to Baltimore, New Jersey, and the “garment district” of Manhattan. He hopes to secure large contracts with clothing producers for the output of his mill, cotton fabrics. Cotton was the chief economic “export” of Salisbury and employed many citizens of the town and surrounding area. Dr Charlotte Hawkins Brown, founder of Palmer Institute in Sedalia, N.C., sits in the Salisbury waiting room. The other traveler is Dr. Charlotte Hawkins Brown, a well-known educator of the time, who founded the Palmer Institute in North Carolina and who traveled through Salisbury frequently in the 1920s, between her school in Sedalia, North Carolina, and her friends and colleagues in the Northeast. Dr. Brown was African American, and her unavoidable reality was Jim Crow. In her own authentic words, she describes with her trademark dignity an incident that happened to her as a traveler in the Jim Crow era. As museum visitors leave the depot waiting room, they encounter an exhibit section about the railroad conductor and Pullman porter. Graphics and artifacts help illustrate the respective roles of these train-crew members on a passenger train. Tools of their two trades fill an exhibit case. “An Economy in Motion” is the name of a an exhibit section on Salisbury’s economy. In the late 1920s — in historian John H. White's observant phrase — "Railroads carried nearly everything nearly everywhere." The rail-carried “exports” and “imports” — including raw materials, fuels, foodstuffs, and manufactures — of the businesses and industries in Salisbury and surrounding Rowan County are highlighted. The Spencer freight sheds, five miles north of Salisbury, were a major freight hub for Salisbury and the surrounding region. The visitor also finds out about the nationwide mail-order empires of Sears, Roebuck & Co. and Montgomery Ward & Co. Mail-order goods came by mail and by Railway Express. Thus marketing and distribution are the themes. The final part of the exhibition section on Salisbury treats the great Spencer Shops, five miles up the road from Salisbury, where the Southern Railway performed heavy repairs on the locomotives in its fleet. Inspectors, boilermakers, steamfitters, foundrymen, welders, machinists, mechanics, railroad-car repair crews, and skilled workers from numerous other trades worked in the shop complex. The main building was the erecting hall, or "backshop." No. 1401 last received major repairs here in 1951. Two 4000-horsepower diesel locomotive units can be seen, painted blue, pulling a special train of "double-stacked" container cars. Note the cranes (painted dark red here) in the background for on-loading/off-loading containers to or from ships. Overland, the same containers travel long distances on railroad cars such as these, or on special truck trailers (called "chassis") designed to carry containers by highway on shorter trips to and from ports. This is an image of modern railroading at the end of the 20th century. Two freshly painted diesel locomotive "units" pull a train carrying freight "containers" from the Port of Los Angeles, heading eastbound. Trains like this often go on coast-to-coast runs and can arrive at a container terminal on the opposite coast in as little as four days. Other container-loaded trains go to domestic destinations. A common use of containers — called intermodal containers because they are transported equally well by ship, truck, and rail — is in "land bridge" operations, which began in the 1980s. Products of east Asia go via the Pacific Ocean to a west-coast container terminal in the U.S. or Canada, then go by rail to an east-coast port, and then travel by sea to Europe. Such a routing is often faster than going through the Panama Canal. Trains with other types of freight cars carry (in approximate order of importance by volume) coal, industrial chemicals, new motor vehicles, grain, other farm products, minerals, lumber, paper, heavy machinery, and many other commodities, including scrap steel and paper for recycling. An electric-powered locomotive pulls a train at 90 miles per hour between Washington, D.C., and New York City in the late 1930s. Electric locomotives draw their power from a high-voltage, overhead wire. The wire is held aloft by a complex suspension system called a catenary. This type of electric locomotive (the GG-1) was styled by the industrial designer, Raymond Loewy, and ran in daily service from 1935 until the early 1980s. This photo shows No. 4800, the prototype of the class. Steam locomotives continued to pull passenger trains on railroads all over the country until the mid-1950s. But the number of steam locomotives rapidly diminished after the end of World War II in 1945, as new diesel locomotives replaced them soon after. In the 1930s and early 1940s, some steam locomotives were "streamlined" — i.e., given new, Art Deco-styled exterior skins over what was still traditional steam technology underneath. Some of these locomotives were quite beautiful, such as those for famous trains like the "20th-Century Limited" from New York to Chicago, the "Hiawatha" between Chicago and the Twin Cities, and the "Daylight" between San Francisco and Los Angeles. But the real story after 1945 was the quickly disappearing railroad passenger. Amtrak's long-distance train, the "Crescent," crosses the James River in Virginia. This "Crescent" is named for the former "Crescent" of the Southern Railway. Locomotive 1401 frequently pulled the old "Crescent Limited" on part of its route, including Salisbury, N.C. In 1926, when Southern Railway locomotive 1401 was built, about 800 million intercity passengers and commuters boarded trains nationwide, and almost 32 billion passenger-miles were generated by the major railroads annually. (A passenger-mile, a standard measure, is one passenger carried one mile.) Then, during World War II (1941-1945, when there was gasoline and tire rationing), rail travel surged to record amounts, peaking at nearly 98 billion passenger-miles in 1944. After that, steady decline in rail travel set in as Americans took to the highways and, increasingly after 1960, to the skies. By 2000, rail passenger-miles, for commuter and intercity, were about 15 billion. But the U.S. population was much greater, and overall mobility had expanded enormously since mid-century. (Sources: U.S. Department of Transportation; Eno Foundation; Assoc. of Western Railways, Railroad Facts, 1958 ed.) In the 1960s, railroads across the country were in deep financial trouble, as both freight and passenger revenue eroded. Costs of running passenger trains, in particular, became untenable, given the steep decline in the number of rail passengers carried each year. Meanwhile, the Interstate Commerce Commision (then the federal agency regulating ticket prices and routes) would not let a railroad cease running any passenger trains without extensive hearings and long delay. Amtrak's high-speed "Acela Express" trains started service between Washington, New York, and Boston in 2000. Like all high-speed trains elsewhere in the world (in Europe and Japan), the "Acela" is electric-powered. This train can operate up to 150 miles per hour. Finally, Congress stepped in to relieve railroads of the costs of running passenger trains. Amtrak— the National Railroad Passenger Corporation—started operations in 1971, taking over long-distance train service from nearly all of the rail carriers. Other exhibit sections of America on the Move continue the railroad story, in the context of other kinds of transportation. "Transforming the Waterfont" treats "containerization" — the great shift in international freight transport from "break-bulk" ships (in which overseas cargoes were carried deep in the holds of traditional freighters) to standardized steel boxes that can be carried equally well by ship, truck, and rail. The final section of America on the Move, "Going Global: Los Angeles, 1999," presents in vivid electronic imagery the fast-paced world we live in today, in which intense mobility and computer-managed commerce are part and parcel of everyday life. International food marketing, apparel distribution, and people in a transportation-animated city illustrate our modern, transportation-dependent world. Thus the final exhibit section reinforces the principal theme of America on the Move: transportation fundamentally shaped America — and will continue to do so.